WASHINGTON, DC, October 18, 2018 – On this ninth day of the southern India Dussehra Festival, an auspicious day called Ayudha Pujai, for the start of new ventures, the South India Term Abroad (SITA) program has bestowed a gift of $195,000 to the Fund for Education Abroad (FEA) to fund a legacy scholarship for study in India. Named The South India Term Abroad (SITA) Nallennam Scholarship, derived from the Tamil word, nallennam, for benevolence and goodwill, the gift will create two endowed scholarships: $5,000 for a full semester program and $2,500 for a summer term. The gift is part of FEA’s “Bringing the World Home” capital campaign, launched in 2017. Preference will be given to those students who wish to study abroad in southern India. Additionally, preference will be for the former SITA consortial member institutions (Bates, Bowdoin, George Washington, Grinnell, Oberlin, Sarah Lawrence, Smith, and Whittier), but otherwise, the scholarships are open to all who wish to apply. From its inception in 1990 until its final scholarship offered this year, SITA offered students diverse and creative opportunities to take classes, conduct field research, live with host families, and travel throughout South India. SITA alumni have pursued further research opportunities with prestigious fellowships, became scholars in South Asian related fields, applied their experience in professions from public health to law, and with every south Indian meal or story shared with friends and family. FEA Scholars come from a variety of racial, ethnic and socioeconomic backgrounds and represent higher education institutions across the country. Students study across the globe, from a minimum of four weeks to a full academic year. FEA funds scholarships of up to $10,000 for study abroad. 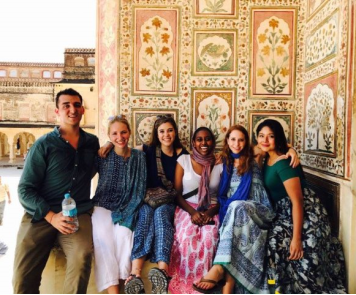 Caption: FEA Scholar Selaem Hadera (center) and her classmates in New Delhi.